These days, it seems like everybody who’s doing anything on the craft scene has one of those amazing (and amazingly expensive) cutting machines such as a Cricut or Silhouette. While I myself have salivated over one, I simply cannot justify the cost when I’m just not sure how much I will use one. 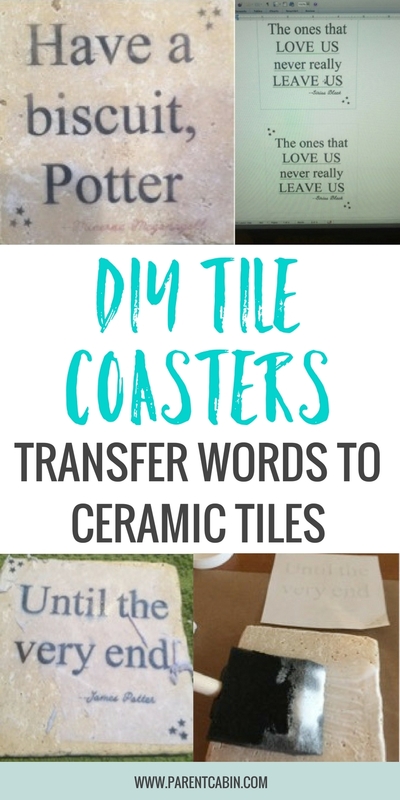 I thought really long and hard about buying one to transfer vinyl words and make DIY tile coasters for my new daughter-in-law, but after some research and a bit of courage, I found a way to transfer words onto tile coasters without a machine. My daughter-in-law is a huge Harry Potter fan, and she found these awesome coasters on Etsy. But much like the sticker price on the cutting machine, I couldn’t justify buying these coasters at $11.00 each, so I tried making my own. If you’re strapped for time or are under a bit of stress, I highly encourage supporting our wonderful crafters in their Etsy stores, but if you’re willing to give it a shot, try what I did and make some DIY tile coasters. With just a printer, four coasters, and some Mod Podge, you can make your own DIY tile coasters for around $1.00 each. 4×4 tile coasters (these are getting harder to find, as styles have changed in home stores to larger tiles, but I still found some at Menard’s). * You only need 4 for a set of 4 coasters, but I purchased a pack of 8 for under $4.00. My coasters look like the one under this list of supplies. 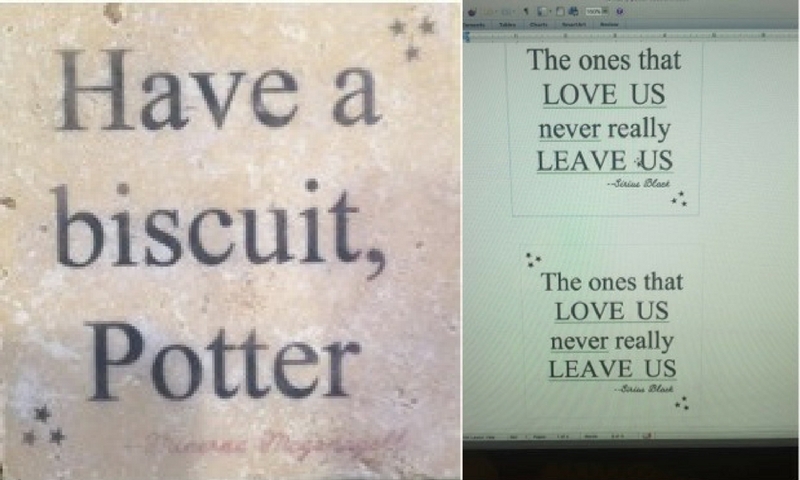 This part was done for me, as my daughter-in-law wanted some of her favorite quotes from the Hogwarts family. I found four—one saying for each coaster. Open a Word document. Create a 4×4 text box for each saying. Type the quote, or saying, into the text box. Choose a thicker font, and make the font as large as you can while ensuring they have a nice look to them. I used basic Times New Roman, bold, with sizes anywhere from 28 to 60, depending on how short the saying was. I chose to add a line width and color to the text box for a visual size guide. To do this, click on your text box, go to “format,” choose “line,” scroll to “weight,” and choose ¼. I also chose a very light blue for the line color, knowing I would cut inside that line before laying it onto my coaster. 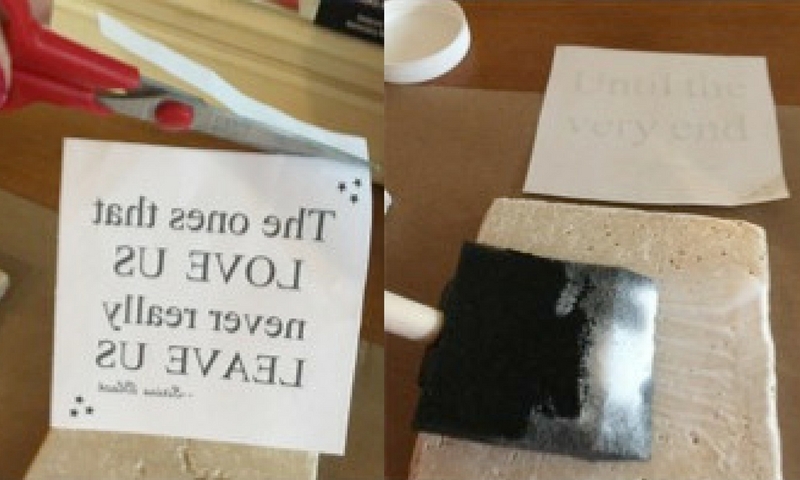 On this step, you need to create a mirror image of your sayings before printing them. You can google “how to create a mirror image on a Word document,” which I also did, or if you’re using a Mac, follow my directions: Choose “print;” click on “copies & pages;” scroll down to “layout;” click on the “flip horizontally” box. Then click “print.” Your pages should print out with the mirror image as the ink side..
Make sure your coaster is clean and dry. I actually performed this step first. Although the coasters do not take long to dry, I allowed them to do so as I created my templates on the computer. 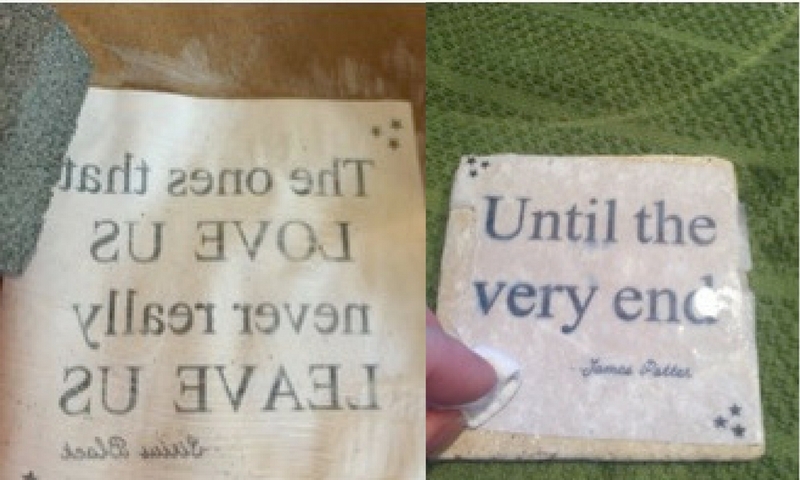 To adhere the sayings, cut each quote just ever-so-slightly smaller than the coaster. You do not have to be exact. Using the foam brush, add a generous coat of Mod Podge to the coaster. Then add a lighter coat to the ink side of the paper. Turn the paper over and place it onto the coaster. You want to make sure you get the paper centered where you want it onto the coaster, as moving the paper might make the ink smear. Let it sit for about 30 seconds, and then gently rub out the air bubbles so every bit of the paper is adhered to the coaster. Let sit for 24 hours. This step is important. If you don’t wait, then the coasters will not turn out. Prepare a bowl of tepid water. Holding the coaster, gently set it in the water, paper-side down. Pull the coaster out. Then, taking an old cloth, gently rub off the paper in a circular motion. If you need to, you can dampen an edge of the cloth in the water to help loosen the paper. The important thing here is finding that right touch—firm enough to rub off the paper, but gentle enough to not rub off the ink. Just take your time and be patient. Then, let the coaster completely dry. One time a day for 3 days, add a coat of Mod Podge onto the coaster, waiting a full 24 hours between each coat. That way, your coaster won’t stay sticky. At first the coaster will have a bit of film on it, but the Mod Podge dries clear. Let cure for 28 days before placing hot drinks on them. I know DIY tile coasters have been around for awhile. I’ve seen them done with stamps, with sharpies, and with the cutting machines. More recently, people have been using scrapbook paper. But it’s pretty hard to find simple instructions on how to transfer words without using the items just mentioned. By the way, my daughter-in-law absolutely adored the coasters! Here’s to creating simple crafts on a penny budget!